P S Verma & V K Aggarwal (biology) Solutions for Class 9 Science Chapter 2 The Fundamental Unit Of Life Cell are provided here with simple step-by-step explanations. These solutions for The Fundamental Unit Of Life Cell are extremely popular among class 9 students for Science The Fundamental Unit Of Life Cell Solutions come handy for quickly completing your homework and preparing for exams. All questions and answers from the P S Verma & V K Aggarwal (biology) Book of class 9 Science Chapter 2 are provided here for you for free. You will also love the ad-free experience on Meritnation’s P S Verma & V K Aggarwal (biology) Solutions. All P S Verma & V K Aggarwal (biology) Solutions for class 9 Science are prepared by experts and are 100% accurate. Size of the cell is comparatively small (1–10 nm). Size of the cell is larger (5–100 nm). Nucleus is absent. Nucleus is present. Cell division occurs by fission or budding (no mitosis). Cell division occurs by mitotic or meiotic cell division. Membrane-bound cell organelles are absent. Membrane-bound cell organelles are present. They are found in multicellular organisms. They are found in unicellular and multicellular organisms. They are formed by tissues. They are formed by micromolecules and macromolecules. Different organs constitute organ systems. Different organelles constitute cells. It is larger than nucleoid. It is comparatively smaller than nucleus. It has a covering of double membrane. Covering membrane is absent. Nucleolus is present. Nucleolus is absent. Its DNA is wrapped with histone proteins to form chromatin. Histone proteins are absent and DNA of a nucleoid is often naked. Glass lenses are used. Electromagnets are used. It uses a beam of light to illuminate the object. It uses a beam of electrons to illuminate the object. Internal vacuum is not essential. Internal vacuum is essential. Cell was first discovered and named in 1665 by an English scientist Robert Hooke. He was examining a thin slice of cork and observed that the cork resembled the structure of honeycomb consisting of many little compartments. He called these compartments as cells (meaning 'little room' in Latin). In 1838, Jakob Matthias Schleiden first proposed the idea that all plants consist of cells. In 1839, Theodor Schwaan proposed that all animals and plants are made up of cells. (i) Intrinsic proteins: They completely cover the lipid bilayer. (ii) Extrinsic proteins: They occur either on the outer surface or on the inner surface of the lipid membrane. Diffusion is the process of movement of molecules from a region of high concentration to a region of lower concentration until an equilibrium is reached. When concentration of gases such as CO2 gets high in the cell as compared to the external environment, then CO2 moves out of the cell by the process of diffusion via plasma membrane. Similarly, O2 enters the cell by the process of diffusion when its concentration is reduced in the cell. Osmosis is the movement of water from a region of higher water concentration to the region of lower water concentration through a semi-permeable membrane. 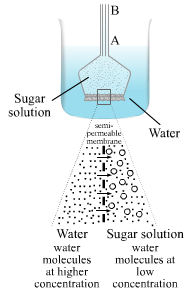 Following experimental set up explains the process of osmosis. It can occur in any medium. It occurs only in liquid medium. Diffusing molecules may be solid, liquid, or gas. Movement of only solvent molecules occur. It does not require a semi-permeable membrane. It requires semi-permeable membrane. It achieves an equilibrium in the free energy of diffusing molecules. It never achieves an equilibrium in the free energy of solvent molecules. All of these processes require energy, so these may be considered as different forms of active transport. When we place an eukaryotic cell in hypotonic solution, it swells up and ultimately bursts because of the large quantity of water entering the cell. When we place an eukaryotic cell in isotonic solution, there is no change in its size, as the water concentrations in the external and internal media are the same. When we place an eukaryotic cell in hypertonic solution, it gets plasmolysed because of the excess loss of water. (a) Ribosome is the smallest cell organelle. (b) Nucleus is the largest cell organelle. (c) ER studded with ribosomes is referred to as rough endoplasmic reticulum (RER). (d) Genes are the functional segments of the DNA molecule. It is a green plastid. It is a non-green plastid. It contains chlorophyll and carotenoids. It lacks chlorophyll. Only carotenoids and phycobilins are present. They are present in both animal and plant cells. They are present only in animal cells. They aid in the synthesis of proteins. They do not have any function in protein synthesis. They aid in cell division. It is larger in size than animal cell. It is comparatively smaller in size. It contains a cell wall. It lacks a cell wall. Plastids are present in plant cell. Plastids are absent in animal cell. It lacks centrosome and centriole. It contains centrosome and centriole. If the nucleus of a cell is removed, then the cell will die. This is because the nucleus of a cell controls all the metabolic activities in a cell, and if it is not present, then the metabolic functioning of the cell will stop and its protoplasm will dry up ultimately, causing cell death. Spinach looks green due to the presence of a green pigment called chlorophyll in them. Similarly, papaya looks yellow and edible part of watermelon looks red due to the presence of coloured plastids called chromoplasts in these fruits. Chromoplasts lack chlorophyll but contains carotenoid pigments that give different colours to these fruits. It was proposed by Singer and Nicolson to explain the ultrastructure of the plasma membrane of the cell. It can be described as 'a number of protein icebergs floating in a sea of lipids'. This is the most accepted model as it describes the properties as well as the organisation of plasma membrane. (i) Intrinsic proteins: It completely covers the lipid bilayer. (ii) Extrinsic proteins: It occurs either on the outer surface or on the inner surface of the lipid membrane. Proteins and lipids provide flexibility to the plasma membrane that helps it in the movement of molecules in and out of the cell. (i) Nucleus: It controls all the metabolic activities of a cell and regulates the cell cycle. (ii) Endoplasmic reticulum: They provide skeletal framework to the cell and are concerned with the production of lipids and proteins. (iii) Ribosomes: They play an important role in protein synthesis. (iv) Mitochondria: They are the powerhouse of the cell as they provide energy to the cell by performing cellular respiration. (v) Golgi apparatus: It is involved in the synthesis of cell wall, plasma membrane, and lysosomes. (vi) Lysosomes: They are the cellular housekeepers and form a kind of garbage disposal system of the cell by removing worn out or damaged cellular organelles. (vii) Vacuoles: They help in maintaining the osmotic pressure in the cell. and also in storing excess nutrients and molecules. (viii) Peroxisomes: They carry out certain oxidative reactions (detoxification) and remove the toxic substances from the cell. (ix) Centrosome: It helps in cell division in animal cell. Nucleus is a large, centrally located spherical component of cell. It is enclosed by two nuclear membranes, collectively called nuclear envelope that are connected to the endoplasmic reticulum. 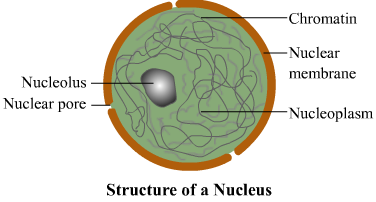 Nuclear envelope contains many nuclear pores and encloses the nucleoplasm (liquid ground substance). Nuclear pores help in the transfer of materials between the nucleoplasm and the cytoplasm. Nucleolus (one or more in number) and chromatin material are embedded in the nucleoplasm. Nucleolus is rich in proteins and RNA molecules and acts as the site for ribosome formation; hence, it is referred to as ribosome factory. The chromatin material is a thin thread-like inter-coiled mass of chromosomes and contains DNA and proteins. It is formed by repeated units of nucleosomes. It is condensed into two or more thick ribbon-like chromosomes during cell division. (i) It controls all the metabolic activities of the cell. (ii) It regulates the cell cycle. (iii) It is responsible for the transfer of heredity traits from parent to offspring. 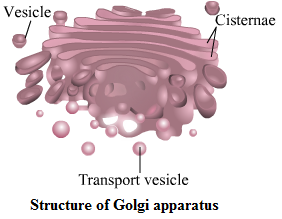 Golgi apparatus consists of a set of membrane-bounded, fluid-filled vesicles, vacuoles, and flattened cisternae. Cisternae are stacked together in parallel rows. They are formed at one end of the stack, called cis face of Golgi, and are budded off as vesicles at the other face, called trans face of Golgi. Golgi apparatus arises from the membrane of smooth endoplasmic reticulum. Golgi saccules (cisternae at cis and trans face) are constantly renewed. Distal saccules (trans face) disappear after vesicle formation. The main function of Golgi apparatus is to secrete vacuoles or secretory vesicles that contain cellular secretions such as enzymes, proteins, and cellulose. Mitochondria are tiny bodies of varying shapes and sizes distributed in the cytoplasm. They are bounded by a double membrane envelope. The inner membrane is folded several times forming cristae. Each cristae are studded with small round bodies known as F1 paricles or oxysomes. Matrix of mitochondria contains ribosomes, DNA molecule, and phosphate granules. The main function of mitochondria is to synthesise ATP (energy-rich molecule) and provide energy to the cell via cellular respiration; hence, they are called as powerhouses of the cell. (i) It forms a supporting skeletal framework of the cell. (ii) It provides a pathway for the distribution of nuclear material from one cell to the other. 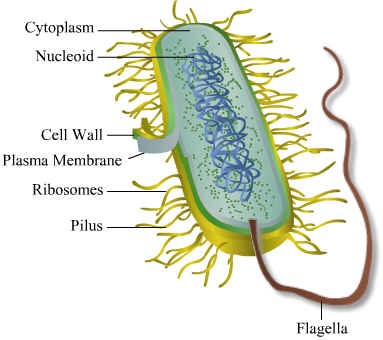 (i) They remove the worn out or poorly working cellular organelles by digesting them to make way for new cells. (ii) They destroy foreign materials such as bacteria and viruses that enter the cell. (a) Ribosome is the cell organelle that synthesises protein. (b) Leucoplast is the type of plastid that stores food. 'Lysosomes are known as suicide bags' because the enzymes of lysosomes eat up their own cells if the cells get damaged. This is referred to as autolysis or self-digestion in which the cell is destroyed by the action of its own enzymes. (a) Cell inclusions: They are considered to be the non-living components of the cell that do not possess metabolic activity and are not bounded by membranes. (b) Cytosol: It refers to the soluble part of cytoplasm that contains protein fibres and is located between the cell organelles. (c) Protoplasm: It is the living content of the cell that is surrounded by the plasma membrane. (d) Nucleoplasm: It is the ground substance of the nucleus enclosed by a nuclear envelope. Ribosomes are composed of RNA (Ribonucleic acid) and proteins. Ribosomes are synthesised in the nucleolus part of the nucleus as nucleolus is rich in RNA and protein molecules. Nucleolus is referred to as factory of ribosomes. These are the tiny bodies of varying shape located in the cytoplasm. They are self-replicating organelles as they have their own DNA. They synthesise energy-rich compounds (ATP); hence, they are referred to as powerhouse of the cell. They are present in only plant cells. They have their own DNA and ribosomes and are self-replicating. Their function is to provide colour to plants (chromoplasts), to perform photosynthesis (chloroplasts), and to store food in the form of starch, fats, and proteins (leucoplasts). Nucleus, endoplasmic reticulum, ribosomes, mitochondria, Golgi apparatus, lysosomes, plastids, chloroplasts, vacuoles, peroxisomes, and centrosomes. (i) Nucleus: It is responsible for all the metabolic activities of the cell. 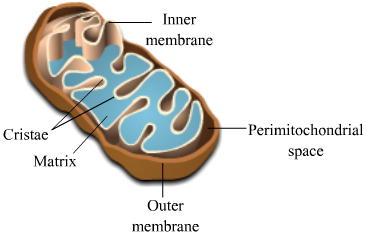 (ii) Mitochondria: It synthesises energy-rich compounds (ATP) in the cell that is then used in various processes. (iii) Ribosomes: They are responsible for the synthesis of proteins in the cell. (a) Chromatin is located in the nucleoplasm of the nucleus. (b) Chromosomes are located in the nucleus. (c) Tonoplast forms the outer covering of the vacuole. (d) Nucleolus is located in the nucleoplasm of the nucleus. Genes are the functional segments of DNA. They contain the hereditary information of the cell. They are located in the nucleus of the cell. 'Lysosomes are also called digestive bags' because they destroy the foreign materials such as bacteria and viruses that enter the cells by digesting them and protects the cell from viral and bacterial infections. Mitochondria is known as the 'power plant' of eukaryotic cell. Its function is to provide energy to the cell. It synthesises energy-rich compound (ATP) by the process of cellular respiration that stores energy. The energy stored in ATP is used by the cell for various processes. Centrioles are hollow and cylindrical structures made up of microtubules. Two centrioles combine to form a centrosome. The function of a centriole is to form spindle fibres during cell division in animal cells. Lipids and proteins constituting the plasma membrane are synthesised by the endoplasmic reticulum. Smooth endoplasmic reticulum (SER) is involved in the synthesis of lipids, whereas rough endoplasmic reticulum (RER) synthesises proteins. 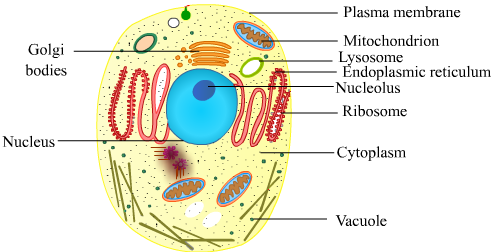 Plasmolysed cell refers to a cell that has shrunk due to loss of water. It occurs if the cell is kept in a hypertonic solution in which the concentration of water is less than that of the cell. 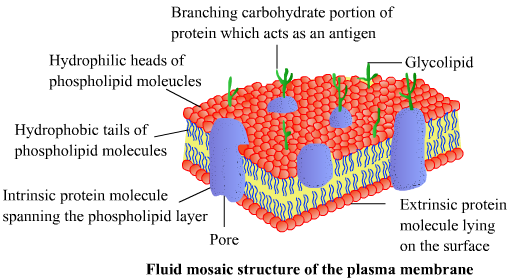 Water crosses the plasma membrane in both directions, but more water leaves the cell than it enters, causing the cell to shrink.